I was an avid and eclectic reader in my teens, devouring everything from Zen and the Art of Motorcycle Maintenance to The Drifters, The Beatles’ Illustrated Lyrics, On the Road, The Pump House Gang, and the Foxfire books. Yeah, it was the ‘70s. The only trouble with being a teen, besides just about everything, is that there’s a tendency to roll one’s eyes at things that are organized around this age group. Especially when the actual word “teen” is invoked, people of that demographic tend to get a bit stroppy. The problem, I think, is not so much the effort put into such things as the drastic differences within the age group – between 13 and 19 (middle school and college), a lot of changing and trying things on for size and growing out of things takes place. Most of it completely out of your control, or so it seems. Still, this should in no way undermine the genuine care put into these events and the age-appropriate benefits that can accrue from (holding your nose) and joining in. All this to say, a theme week kicks off this Sunday, Oct. 16 – 22, called “Picture It @ Your Library,” and it’s about encouraging teenagers to check out graphic novels and other types of creative or illustrated literature (I think the latter implication is comic books…). Sponsored by the Young Adult Library Services Association, the earnestly named Teen Read Week is now a teenager itself, having been around for 13 years. Libraries offer special events for teens to encourage reading and utilizing library resources for fun, study and exposure to new worlds and ideas. For parents, aunts, uncles, godparents, family friends, teachers and anyone else who has the great good fortune to spend time around humans of the teenage persuasion, the American Library Association reminds you that Teen Read Week is also an opportunity to let libraries, schools and other community organizations know how you feel about the need to support programs and services for teens. 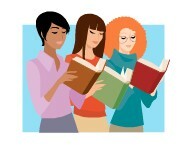 There’s a ton of resources and additional information for Teen Read Week on the YALSA site.